Looking back on many of the greatest jazz recordings, it can be hard to separate the sound of a particular record from the associations we have with its creators. It’s not easy to listen to, say, Steamin’ With The Miles Davis Quintet the way it would have been heard at the time, or even as the band expected it to be heard – because we know that Miles went on to have at least two more exemplary bands, John Coltrane pioneered the avant-garde and died in 1967, etc. With the first jazz records I remember hearing, though, I have the opposite problem. Even though the sound of Thelonious Monk’s piano, Oscar Pettiford’s bass and Kenny Clarke’s drums on Thelonious Monk Plays Duke Ellington, for example, completely exemplify their unique styles, I can’t quite connect the sound of that record with any other by those musicians. The sounds are obviously the same, and yet I have a hard time contextualizing them. That’s simply because I didn’t have any context when I first heard them. Soul Station is a good example, because there’s a lot of context to be found. 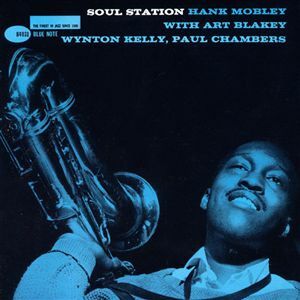 When tenor saxophonist Hank Mobley walked into Rudy Van Gelder’s New Jersey studio to record the record that would become his best known, he was two years out of a long association with Horace Silver (Mobley was one of the original Jazz Messengers), one year away from a short stint replacing Coltrane in Miles Davis’s quintet, and sounded as good as he ever would. With him in the studio was the piano/bass team he would join with Miles Davis – Wynton Kelly and Paul Chambers. Both were Blue Note regulars, but Mobley’s chemistry with them on his own records and with Miles is underrated. Art Blakey, Mobley’s old boss, was on drums. There’s the context, readily available and pretty neatly laid out and logical. But this record isn’t so logical as all that. Even though Alfred Lion and Mobley succeeded in laying out a completely typical hard bop date – complete with Bobby Timmons-esque tune titles like ”Dig Dis” and plenty of bluesy melodies – they failed in actually creating one. What was made was an exemplary hard bop date, and one that sits, like all classics, outside of its creators’ regular trajectories. There’s no second horn on this date, a rarity in a quintet-obsessed era, and the extra space is used to awesome advantage by Mobley. The leisurely but inevitable progression of Mobley’s solo on the title tune wouldn’t be possible if Freddie Hubbard, Lee Morgan or Donald Byrd was waiting impatiently in the wings. The absence of another horn also means that Soul Station isn’t an interrupted statement. These four musicians play so well together as a unit that it’s hard to imagine the chemistry surviving an addition to the group; in fact, we don’t have to imagine it, as 1961’s Roll Call is the same quartet plus Freddie Hubbard on trumpet. The music is good, but it’s no Soul Station. Nothing really is, to me, anyway. Now that I have years of listening to jazz under my belt (and coming on four of writing about it), I can identify all the context to be found in Mobley’s work, and in the styles of his sidemen on Soul Station. I can even hear it, sometimes. But habits are hard to break, and my habits about listening to this record were formed when I knew nothing about jazz – about bebop, hard bop, Mobley, Blakey, Blue Note or anything. That’s what makes this, and most of the other records I’m discussing on this blog, hard to write about. It’s easy to hear the music, but hard for me to label it. And I like it that way.